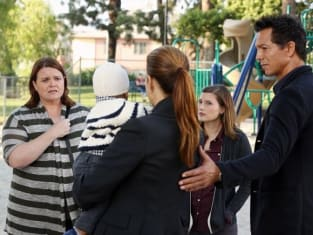 Last week’s Sam-centric episode was one of the worst in Private Practice history. Fortunately, tonight’s installment focused on the main reason we all first started watching: Addison. The question was whether "Apron Strings" would change it up from “The Next Episode” and generate actual momentum as we inch closer to the series finale. Most importantly, would these character-based episodes continue to be a snoozefest or would Shonda and company deliver stellar stories that loyal viewers so rightfully deserved? Well, tonight did not disappoint. The Addie-anchored installment kept me glued to my seat as Addie’s plate was certainly full with numerous obstacles. First, Henry’s biological mother, Judi, resurfaced and asked to be a part of Henry’s life. Initially, I struggled to understand what exactly Judi wanted and really did not want her to mess up Addie’s seemingly perfect life. By the way, how awkward was the scene with Judi bringing her mom to meet Henry at the park?! Seriously, I really felt for Addie and wanted her to just take Henry back into her arms. Although she knew it wouldn’t be easy, Addie eventually realized that Judi should play a role in Henry’s world. Henry would always have two moms and Addie said that Judi would always be welcome. Addie always does the right thing and is certainly stronger than ever. Meanwhile, Addison found out that her mentor, Vivian, was dying. Vivian shared a painful secret about having to give away her daughter years ago, along with the pain of never knowing anything about her own child. Perhaps the best moment of the night was Vivian’s letter to her daughter. It was heartbreaking and perfectly written while flashing back to the day Henry was born – showing both the happiest day of Addie’s life but also quite possibly the worst day in Judi’s. It was easy to cheer on Addie as we've been rooting for her since day one, but I also found myself feeling very sad for Judi. Moreover, I loved that Addie was able to find Vivian's daughter in the end and pass on her mother's letter. It was a beautiful end to such a touching story. If only that was it. Poor Addie was also being sued for the wrongful birth of a patient born with spina bifida, a birth defect in which the backbone and spinal canal do not close before birth. A mother basically believed that Addie should have advised her to get an abortion years ago. After seven struggling years with her special needs daughter, the mother finally admitted that she didn’t regret having her daughter, but was suing Addie for money after losing both her husband and job. Luckily, Addie convinced the mother that her daughter would never forgive her for going after Addie for the wrong reasons. Addie saved the day once again by trying to secure a job for the woman. Addie proposed! Jaddison fans must have been smiling from ear to ear. Our favorite doctors were back at it with their round table discussions. I forgot how much I actually liked and missed these moments. Charlotte and Cooper were discussing baby names. I seriously can’t wait for their episode! All in all, a solid way to bounce back from last week’s rare disaster of an episode. 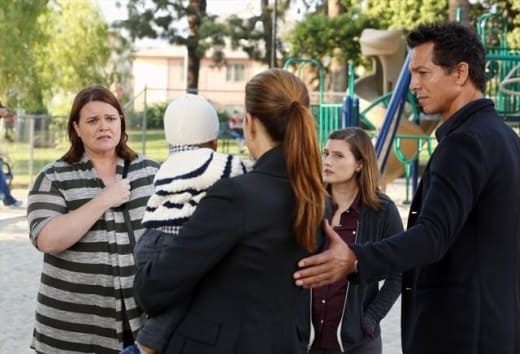 Also, don’t forget to tune in again tomorrow night for another NEW Private Practice installment. Yes, you read that right! Get excited and meet me back here tomorrow evening.